This residence is a combination of apartments DE-56856-23 and DE-56856-26, with an extra bedroom. It can accommodate up to 12 people. Neither apartment is big enough for the entire group to gather in, for eating together for example. So group activities will need to be held outside the accommodation, though this makes it the ideal destination for two groups who would each like to have some privacy. And the location is practically unbeatable: Stroll out the front door of this holiday home and the charming high street with its countless shops is just 30 metres away. Walk another 30 metres, pass under the gate, and you will be on the boulevard – just across from the romantic Mosel River. It's wonderful to dine here in the evening at one of the many restaurant terraces as the sun slowly sets behind the hills on the other side. 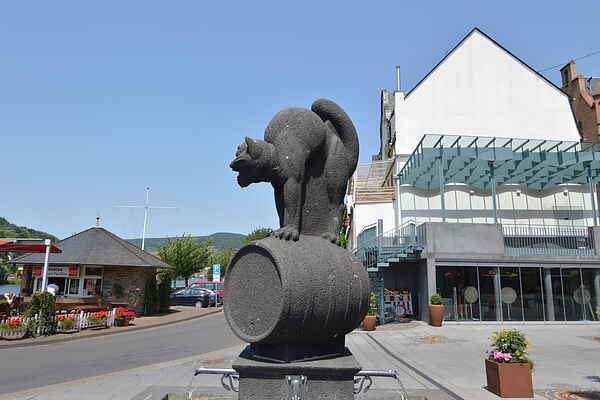 Savour a glass of the local Schwarze Katz wine, named after the time-honoured symbol of this town, as you can see from the black cat in the main square.